At Got Muscle Personal Training, we are committed to providing quality personal training and wellness training services with the highest levels of customer satisfaction. 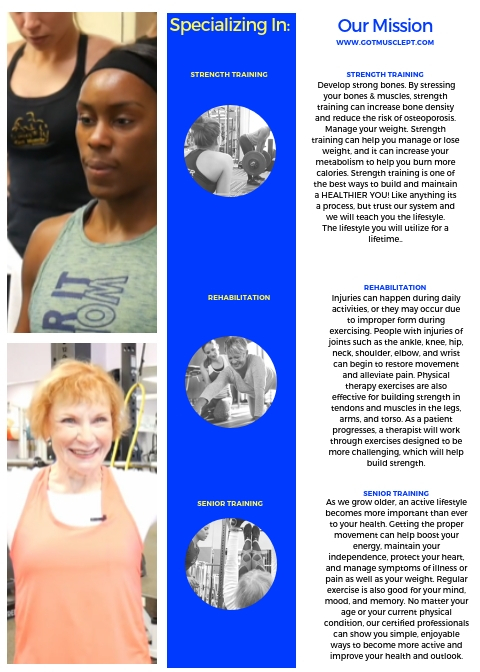 – our fitness advisors and personal trainers will do everything they can to meet your expectations as they help you to meet your fitness goals. With a variety of offers to choose from, we’re sure you’ll be able to find a fitness plan that suits your needs. We offer competitive rates for one-on-one personal training complete with a customized training plan designed to fit your schedule, goals, and abilities. Contact us to schedule a free assessment and let’s take the first steps toward your new lifestyle. Our mission is to give you a dynamic experience, from physical results to a lifestyle impact. Three times per week our fitness advisors and personal trainers will push you through innovative, high-intensity workouts supported by elements of movement, nutrition and regeneration to meeting your fitness goals.